This image of the pre-dawn sky on Jan. 27, 2011, depicts the locations of the moon, Saturn, Venus and several bright stars under clear observing conditions before sunrise. If you get up an hour before sunrise tomorrow (Jan. 27) and have clear skies, you’ll be greeted by a spectacular array of stars and planets spread across the southern horizon with the quarter moon as a celestial centerpiece. 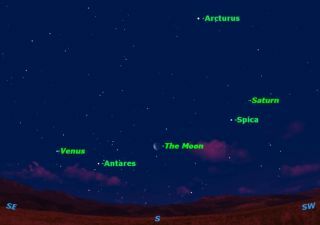 Most people lose track of the moon at this time of the month because it’s in the morning sky.You will see, spread in a gently curving arc, the bright planet Venus, the red giant star Antares (1.0), the moon (–11.8), the blue-white star Spica (1.0), and the planet Saturn (0.7). Above them all, directing the show, will be the orange star Arcturus (–0.7). The numbers following each object listed above indicate their expected brightness, weather permitting, on the upside-down magnitude scale used by astronomers. On that scale, typical stars range from 1 (the brightest) to 6 (the faintest visible to the naked eye). Objects brighter than first magnitude are indicated by minus signs. So the moon, at magnitude –11.8, will be the brightest; Venus, at –4.3, second brightest, Arcturus at –0.7, next. If you observe the moon with binoculars or a small telescope, you will be able to identify some of the craters we looked at two weeks ago, except now the light will be coming from the opposite direction. Watch over the next few mornings as the terminator sweeps westward, engulfing the craters in darkness. While these stars, planets, and the moon will be symmetrically arranged tomorrow morning, things never stay put in the sky. The moon, in particular, moves about 13 degrees eastward every 24 hours. On Friday morning (Jan. 28), the moon will have moved from its central position to lie close to Antares. The next morning it will be between Antares and Venus, and Sunday (Jan. 30) between Venus and the horizon. All the while, the lunar crescent will be narrowing as it heads toward new moon on Feb. 2. This week is an excellent opportunity for early risers to view the dynamics of the moon’s movement against the background of the planets and stars.